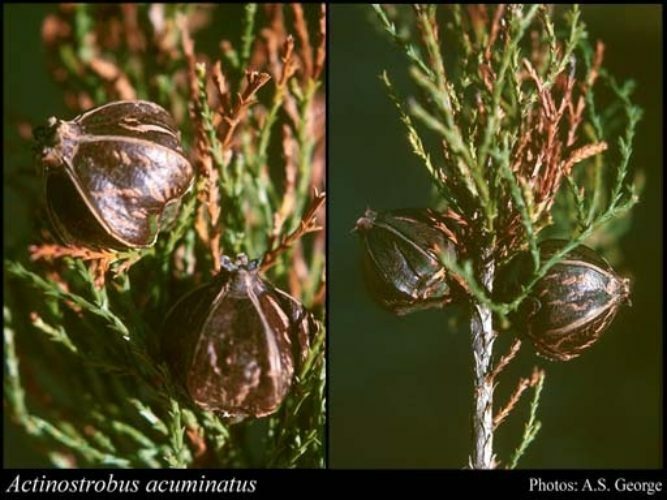 Actinostrobus acuminatus, first described in 1862 by Filippo Parlatore (1816–1877), is commonly known as Moore cypress pine or Creeping pine. 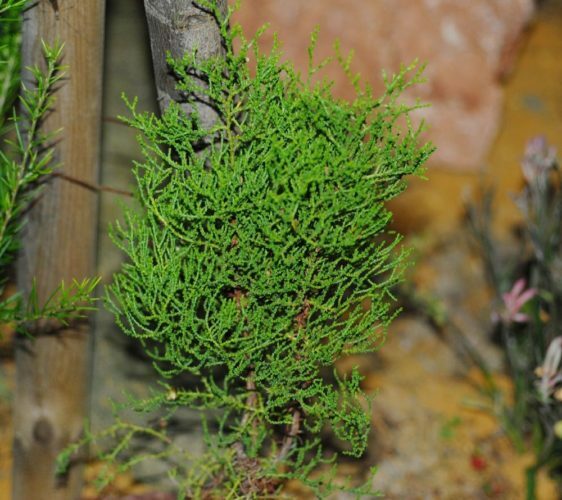 It shares the common name Dwarf cypress with several other plants, and shares the name Creeping pine with others. Description. Moore cypress pine is an evergreen coniferous species of tree in the Cupressaceae (cypress) family. It is a prostate plant or a small broadly conical shrub to 10 feet (3 m) tall. Plant spreads by underground stolons. Branchlets finely divided, twisted into long branchlets. The leaves are evergreen and mixed scale-like and needle-like, except on young seedlings, where they are all needle-like. The leaves are arranged in six rows along the twigs, in alternating whorls of three. The scale leaves are 0.08 to 0.16 inch (2 – 4 mm) long, the needle leaves 0.4 to 0.8 inch (10 – 20 mm) long. The pollen cones are small, 0.12 to 0.24 inch (3 – 6 mm) long, and are located at the tips of the twigs. The seed cones start out similarly inconspicuous, but mature in 18 to 20 months to 0.6 to 0.8 inch (15 – 20 mm) long, with a pointed apex. Distribution. Like the other species in this genus, it is endemic to southwestern Western Australia —endemic from Eneabba south to the Perth district, where it can be found along the shorelines of rivers. The Mount Henry Peninsula is an example of the environment in which this cypress is found. Actinostrobus acuminatus, a photo taken along the Brand Highway, Western Australia.